I shouldn’t be as shocked by the news, but I’m still amazed when I think of the recent press out of the 2014 summer Outdoor Retailer Show in Salt Lake City: Therm-a-Rest announced a line of hammocks and accessories (yes, that Therm-a-Rest). Hammock camping has been steadily picking up momentum and I’ve been waiting eagerly for one of the “big box” outdoor retailers to come out with some hammock-related gear, perhaps some accessories, tarps, or even insulation options, but coming out of the gate with a full line of hammocks was news. And that this is coming from Therm-a-Rest is simply a revelation. 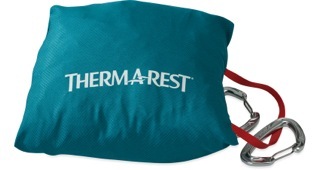 The Therm-a-Rest Slacker Hammocks stuff into a built-in stuff sack. No word yet on suspension systems. Therm-a-Rest has made a strong following for its superior line of ultralight camping air mattresses, and in recent years they have rounded out their product line with a complimentary assortment of sleeping bags, pillows, and other sleeping accessories. When put in this light, I guess it shouldn’t surprise me that Therm-a-Rest would include hammocks in their line-up. Therm-a-Rest is about as mainstream as it gets, and with them leading the way, I wonder how many other vendors will jump on the bandwagon? The truth is, hammocks are relatively inexpensive to produce. The basic design is simple, and if you merely want to offer a “recreational” hammock as an “up-sell” to other camping gear, the investment is relatively low. Since they have built such a strong brand around sleeping comfortably while camping, offering a hammock is a natural fit for Therm-a-Rest. I connected with their PR firm and gathered the following details about their upcoming products. According to my sources, these products will be available at select retailers in December and available everywhere January 2015. 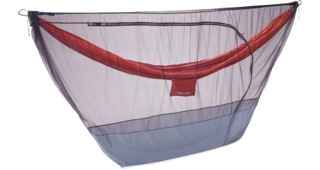 According to their materials, the attached pocket on the hammock plays double-duty as a stuff sack as well as a holder for books, tablets, and other small items. The hammocks feature a custom, woven diamond ripstop fabric which eliminates lengthwise seams. The hammocks are available in five colors, including two with custom prints. Both hammocks (single, double) are constructed with single panel designs. While I eagerly await the opportunity to test the “Slacker Hammock” from Therm-a-Rest, I will say that the specifications are impressive. Keen observers will note that the hammock’s dimensions are large—even the “single” is bigger than most “double” hammocks already on the market. The fact that these hammocks are made in the USA is a big selling point too. What I’m already impressed with is that these hammocks are made from a single piece of fabric—no seams to run behind your head or under your legs! Personally, I love and prefer polyester hammocks because of how it stretches less and is more supportive. I will be interested to see how the hammock feels in person. Coming from an outdoor insulation retailer, I can only suspect that Therm-a-Rest is working on a complementary set of hammock-compatible quilts, pads, or other accessories. They already sell a line of top quilts, and their sleeping pads are already used by many inside hammocks. It doesn’t take much imagination to guess that there will be other hammock-related accessories coming from Therm-a-Rest in the future. Any word on weight capacity, or educated guess based on your knowledge of hammocks of similar fabric? These should be in the 350 lbs range, which is comparable with the competition. Some hammock manufacturers who use ripstop have gone as high as 400 lbs. Sounds interesting! I cant Wait to See Your Review of the Thermarest! I have been thinking about getting at least 2 more less pricey hammocks to keep on hand for when I take the grand kids camping with me. Was going to get ENO, but now may wait…hmmm. I have the snugpak tropical hammock and I’m rather satisfied with it. Half the price of an eno, which I also have, but rated to the same strength. Thanks for the info and the preliminary review. I like you can’t wait to try one out. Sounds like they are using the same material as the Kammok Roo. They are using polyester which has way less stretch, kammock uses nylon which has more stretch. Oh, these sound very nice. I’ve been thinking of replacing my homemade cotton hammock with a commercial unit just to save weight, and maybe this one will be just the ticket, since I can’t imagine Therm-a-Rest making hammocks without making pads for them. I use a RidgeRest in mine, and it works well, but if Therm-a-Rest can make a matching combo that works even better, I’ll try it. I wonder what the COO of this will be. I know traditionally Cascade Designs has been pretty good about about trying to keep manufacturing in the US. They indicate these are made in the USA. I got the double, 400 lb rating. Made in USA. Very well made, all one sheet of fabric so no seams to lay on. Retail for $79 but I got a 15% discount at austinkayaks.com as a new customer. Love the Hammock, I am using as an indoor hang for sleeping at this time and will venture off to the great outdoors when it gets warmer. Your Video Review helped me make the choice of this hammock and again I love it! I’m glad you like it! It’s one of my new favorites. Very comfortable. I use it indoors all the time.